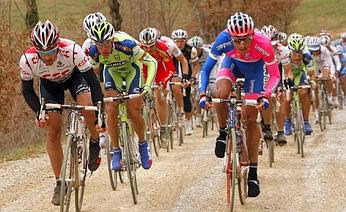 Tomorrow is one of favorite 'new' semi-classic, Montepaschi Strade Bianche. I'm in love with the white roads of the Tuscan hills near Siena. It's the fourth edition and 190 kms long over undulating hills make the riders' look like they're from a period piece from early cycling history. Just take out the cycling helmets give the riders' hairnets, a wool kit, tyres wrapped around their backs complete with steel bikes and of course, clip pedals. It's sparked by the L'Eroica race run as a cyclosportif event. And 'L'Eroica' means 'heroic' in Italian. The Italians have found a unique semi-classic not to rival the legendary classics but to stand out on it's own. Well placed before Wednesday's Tirreno-Adriatico, riders' have grown accustomed to the bianche dirt/gravel roads. 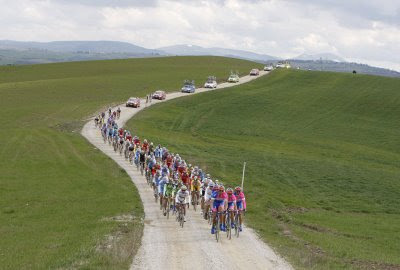 I'm glad that part of the strade bianche roads will be included in a stage of this year's Giro. A bunch of hungry riders' are set to test themselves and I'm still convince that Canadian Ryder Hesjedal (Garmin-Transitions) will be in the top five. He's shown his class and enjoys riding in the dirt and will be there to improve upon last year's tenth place. 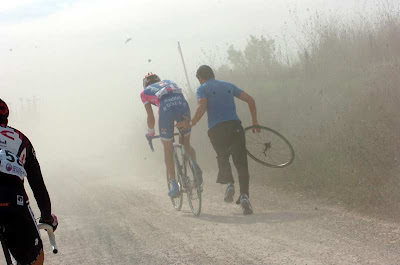 Of course, you have to have a little luck and be on form to beat the dust of the sterrati. My Italian homeboys are Ballan (BMC) & Bennati (Liquigas). Cancellara (Saxo) & Lofkvist (Sky) are heavy favorites to repeat. And there's always a few good men out there; the Garmin threat's Maaskant and the resurging Hunter and let's not forget the 'outsider' rainbow jersey holder, Cadel Evans. Exciting early season racing in Italy with the heroic star going to the strade bianche!